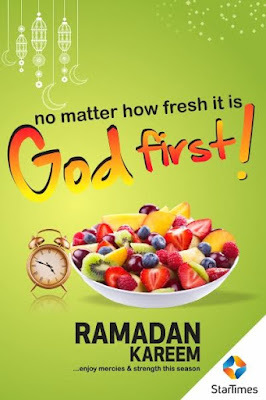 Ramadan is here again and StarTimes is giving you goodies in this Holy month of fasting! • Visit any StarTimes Business Hall (Lagos Only) during the month of Ramadan ONLY. • Recharge your StarTimes account (BASIC BOUQUET AND ABOVE) or purchase StarTimes decoder or Digital TV. • Once transaction is completed you stand a chance to win a lot of goodies at the lucky dip.